Trent Boult’s six-for and a milestone century by Ross Taylor carried New Zealand to a 24-run win over Australia in the third and final One-Day International between the two sides at Seddon Park in Hamilton on Sunday (February 5) and a 2-0 series victory. The excellent performances from Taylor first and then Boult also helped New Zealand reclaim the Chappell-Hadlee Trophy, which it had lost in Australia late last year. The result also meant that Australia lost its outright hold on the No. 1 ranking on the International Cricket Council ODI team table. Steven Smith’s men slipped to 118 ranking points, equal with South Africa, which beat Sri Lanka in Johannesburg on Saturday to go 3-0 up in their five-match series. South Africa will overtake Australia if it wins the remaining two matches. Kane Williamson won the toss and opted to make use of the best batting conditions on the day, but New Zealand looked like it hadn’t done well enough with its 281 for 9 despite Taylor's 107 off 101 balls and Dean Brownlie’s 63. With the series at stake after New Zealand won the first ODI by six wickets and the second was washed out, Aaron Finch and Shaun Marsh gave Australia a brilliant start in its reply, scoring at more than six an over. But Marsh was the first to fall, run out for 22, and Peter Handscomb was bowled first ball by Boult. Finch and Travis Head the continued the good work with a 75-run stand for the third wicket before New Zealand broke through with another two-wicket burst. Williamson had Finch caught by Boult at deep midwicket for 56 and Glenn Maxwell was caught behind off Mitchell Santner without scoring to leave Australia at 120 for 4. After that, Head and Marcus Stoinis kept the chase under control with a 53-run partnership when Boult came back for his second spell and claimed Head for 53 and James Faulkner for a duck in the space of four balls. Stoinis scored 42 before Santner claimed him, reducing Australia to 198 for 7. Mitchell Starc, who scored 29 not out, and Pat Cummins's 27 took Australia to within 32 runs of the target when Boult broke through again to claim the last three wickets to finish with 6 for 33. 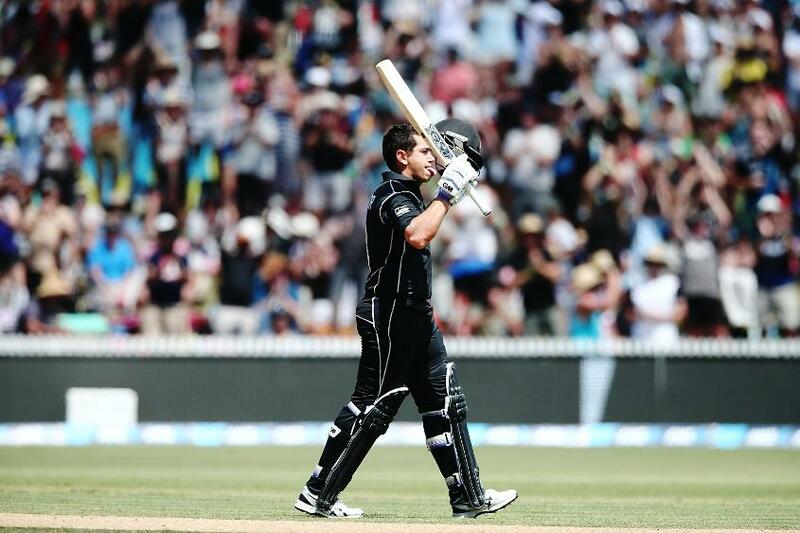 Earlier, Taylor was the star of the New Zealand innings as he equalled Nathan Astle's New Zealand record of 16 ODI centuries. He went in with New Zealand 76 for 2 and Brownlie on 30. By the time he reached his 50, Brownlie had advanced to 47, his previous best, which he crossed soon after. While Taylor thundered along, New Zealand looked set to pass 300, but when Brownlie went for 63 it triggered a middle-order collapse in which four wickets fell for 33 runs. Faulkner took 3 for 59 including the crucial wickets of Brownlie and Taylor.